Modified cars and bikes have always been in vogue and an object of desire for everyone. 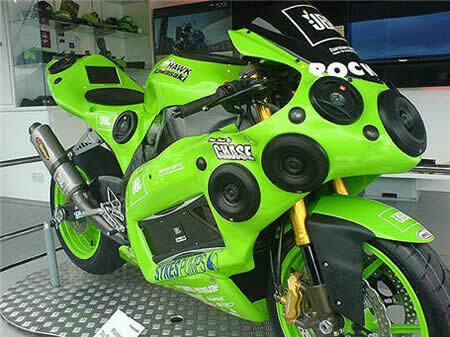 But this particular make case in point Modified Kawasaki ZX10R is one of a kind. It is not only a modified version it has completely redefined the meaning of modifications. This baby is making a lot of noise, literally! It has 12 built-in speakers with 1,500 watts of output, two iPods, a Sony PSP, a flat screen with DVD player and a remote control. There is also a connection for an electric guitar, probably for an on-road performance. If the modification didn’t make you feel like a rock star on a bike the electric guitar connection will surely rock your ride! I don’t know if you fell for this one but i can’t wait to take this one for a ride.